Preparations for Christmas got underway this past weekend with the opening of the traditional Fira de l'Avet (Christmas Tree Fair) in the tiny town of Espinelves, in the northern region of Girona, which is famed for its local species of fir tree. Espinelves has held the fair for the past 38 years, attracting people from all over who come seeking the ideal tree for their homes. Attendance on the opening weekend was positive, according to mayor Joan Manel Claveria, especially on Sunday, due to the good weather. Yet, the busiest moment for the fair is expected to come over the long bank holiday weekend, from December 6 to 9. Over the nine days the fair will last, Espinelves is expecting to welcome a total of 70,000 visitors. In fact, the mayor called on people planning a visit to the fair over the holiday weekend to be patient getting into the small town, and he advised them to try to avoid peak hours "so as to be able to walk around more easily." "We love wandering around because it has a special charm"
Yet, the Fira de l'Avet not only offers Christmas trees, but everything one might need for the festive period, including Nativity scene figures, the traditional Catalan nougat known as torró, garlands, and all types of decorations. However, most people will be drawn to the town looking for one of the local fir trees, known as Masjoanis. 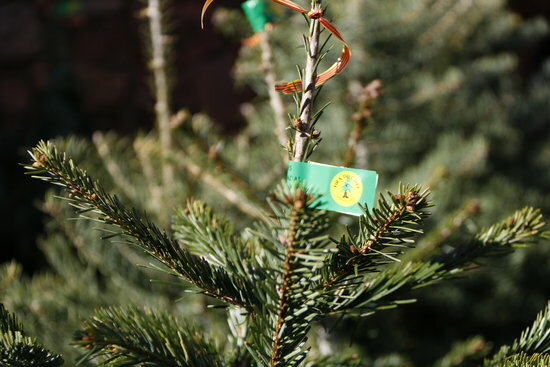 Prices for the sought-after trees go from six euros for the smallest up to 100 euros. The standard size usually costs around 25 euros, says the mayor. How to look after the trees and make sure they remain fresh for the whole festive period is one of the questions sellers get most. "The idea is to water it often," says stallholder Miquel, who recommends watering every two or three days, and spraying it with water. Vicenta and Rafi have been to the fair before, although not for some years, they say. "We love wandering around because it has a special charm," says Vicenta, while Rafi adds that "there is everything here, and the Christmas trees are impressive." Meanwhile, it is Marta's first time in Espinelves for the fair and she says she came because of the "very good reports" she has heard. As she came with a group in a bus, she was unable to buy a tree, but purchased a number of craft food products for her daughter.